Highway Agency's hard shoulder plans | What Car? The Highways Agency has revealed its plans for the next year, which includes the introduction of more hard shoulder-running around Birmingham, queue detection systems and message signs. 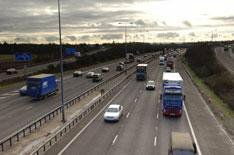 The introduction of more hard shoulder schemes follows a successful trial on the M42. This will be backed up by the introduction of more CCTV and queue detection systems, which the Agency hopes will allow it to inform motorists where hold-ups are. The Agency will also carry out 15 major road improvement schemes, including widening the M1 from junction 6A to 10. It also plans to award the 5 billion, 30-year private finance contract to design, build, fund and operate more than 63 miles of the M25.